Mesa mobile home parks are the best place to begin a new hobby. If you enjoy working with your hands and creating something unique and beautiful, quilting is for you. Palm Gardens offers a variety of community activities every day including quilting. Before you buy all the supplies you’ll need here are a few things a beginning quilter should know. 1. Learn everything you can about the fabric. One of the first things you will purchase to begin your quilting hobby is the fabric. Know your fabrics’ components. Is it a fabric that needs to be pre-washed? Is it going to be easy to work with? Will it fray easily? As you try out different kinds of fabric you will learn which ones work best for you. 2. Sew a quarter inch seam allowance. It is important to always remember a quarter inch seam allowance. If you are an avid sewer you probably normally use a 5/8 seam allowance so this might be a little bit of an adjustment. The quarter seam allowance is vital in creating squares that are all the same size. To achieve a perfect seam allowance you should practice your technique on small fabric patches before you begin a quilt. 3. 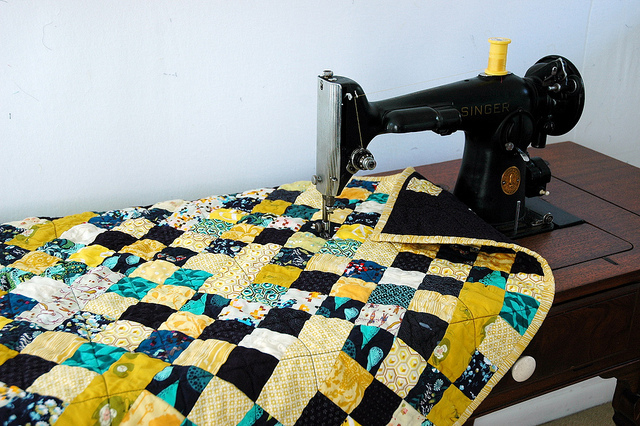 Become familiar with quilting terminology. Even a few terms mentioned already might have you confused and this is why it is important to learn all the quilting terminology. We recommend purchasing a quilting glossary that you can keep on hand if you come across any terms you don’t know. Knowing all the quilting terminology will make the process so much easier. Daily quilting events at Palm Garden’s Mesa mobile home parks will allow you to discuss these terms with fellow quilters. 4. Develop your rotary cutting skills. Rotary cutting is something ever new quilter should master. The tools will allow you to make precise cuts quickly saving you time and allowing the quilting process to be more fun. It is very time consuming to make patterns to cut around by hand so with the rotary cutting tools you will be able to make straighter and quicker cuts. 5. Learn how to press properly. When you are working with a large number of squares it is important to take the time to press the squares with your iron. This will help keep your squares organized and make it easier to sew the squares together once you have them all finished. 6. Measure and sew borders correctly. Adding borders to your quilt allows for you to fix minor mistakes. By adding a border you can square uneven edges. Adding a butted border will add more structure to your quilt. 7. Don’t obsess over errors. With every hobby it is important to not obsess over your mistakes and this is especially true with quilting because there are tips and trick to disguise and fix almost all mistakes. Take every error as a learning experience. As a beginning quilter you are sure to make a few mistakes but each one will allow you to improve. Look for Palm Gardens community activities at http://www.palmgardensonline.com or read more about the mesa mobile home parks and find mobile homes for sale.